The history of the Pulse Jet. The period from 1890 to 1910. Marks an epoch when both an interest in the Air/Fuel pulse jet and the debut of research and development into the subject can be identified. After WW2 a parallel develpment of both propergol rocket jet engines and air breathing RAM or pulse jets programmes by both the US and USSR indicates that a clear cut strategy decision to concentrate soley on pure rocket engine development was not made for some time. By contrast the propergol fueled rocket motors in rocket launchers carry there own oxider and are therefore capable of functioning in a vacuum. Eventually a strategy for developing pulse jets for short to medium range ground to ground ,sea to sea or sea to ground tactical missions began to develop. Where the launch site was variable using either ship,submarine, aircraft or road vehicle launch platforms. Todays cruise missile is a direct descendent. Desire Thomas Piot (1891) 1891 and 1897 British Patents for a vapour pulse jet for powering model boats inspired by the rocket boat demonstration made by Just Buisson and Mr.Cuiru. 1886 Paris and 1887.
' On the reaction force of in-and-out oscillating flowing liquid.' The subject of the paper was developed in two subsequent editions published in 1885 and 1908. The principle is relatively simple to demonstrate . Place a few drops of petrol in a test tube. Mix the fuel vapour with the air in the tube by shaking it and then carefully ingnite with a flame pointing the open end of the test tube away from any observers. Then you will see that the flame front does not burn progressively towards the bottom but oscillates up and down the tube. Pulsing. Note:This can also be seen with other chemical reactions that produce a flame. This was a basic pulse jet research project to find the effects of varying physical tube length and diameter had on the cycle pulse frequency , stability and thrust produced. The jet tube was straight and of constant daimeter. In 1906 The Russian engineer V.V.Karavodin obtained a patent for an airbreathing pulse-jet engine . In 1907 he built a working engine based on his invention. Basically the system produced a high velocity pulsed gas jet generated by a cyclic combustion of a liquid hydrocarbon fuel /air mixture. His tests and development work where based on a fixed pulse jet tube. Today in aeronautics the pulse jet is more commonly known as an air breathing RAM jet. Once airborne the forward velocity of the engine compresses or 'rams' the air at the in take and improves the cycle efficiency. The SCRAM jet technology currently being proposed for reducing first stage launcher costs is a direct descendent of these humble beginings. Note: The definition of SCRAM is Supersonic RAM jet. 1932 Marshall Tukhachevsky Forms the Soviet military rocket research bureau RNII in1932. By fusioning the GDL Leningrad with the GDL Moscow. During this period there was an exchange of technical specifications concerning military rocket developments. Solid propellant research had been undertaken by Glushko at GDL prior to this exchange. Andrey Kostikov starts to split RNII from within to gain control .GDL solid fuel against GIRD liquid propergol. Pulse jet that used a series of oneway valves at the intake end of the tube to intake a fresh volume of air to mix with the atomised fuel prior to ignition. Nov 1937 Head of RNII Kleimenov arrested and shot. At the same time half of his staff were arrested and executed under orders from Stalin. Korolev the Russian astronautic engineer is injured during a static test of a experimental Russian 212 cruise missile. Korolev , Kleimenov's demoted deputy is arrested and sentenced to 10 years in Kolyma Gulag Siberia.With 15 years exclusion from Soviot citizenship and confesscation of all his property. For squandering Soviet government finance by prefering development of liquid fueled rocket engines to solid propegols. Andrey Kostikov is appointed head of RNII. Russian rocket development effectively frozen for 7 years. 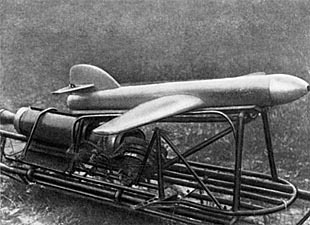 1939 USSR Experimental Russian 212 cruise missle is flight tested. German manufacturer started its own project to produce a pulse jet before deciding to combine resources and work with the experienced Paul Schmidt to produce a forth generation pulsejet. V1 flying bomb.had a launch mass of M1= 2154Kgs.and was restricted to fly within the atmosphere . producing a thrust force F = 2935 N. at an altitude of 910m (Between 650 and 1250m) and normally flew at a velocity of V = 179 m/s. Once the motor had reached operating temperature and had been accelerated to minimum air flow velocity ( launched using a steam catapult ) the air / fuel pulse jet no longer needed its electrical ignition system and continued to run thanks to reflected pressure waves from the jet output nozzle that compressed the new intake charge and ignited it . The reliability of V1 RAM jets was very good and directly related to the simplicity of the design and the minimum number of working parts. The statistical chance of something breaking or failing to function is increased by the number of components and the complexity of the system. The V1 was first used against England on 13th June 1944 one week after the start of the D.Day allied invasion. How much significance the use of the worlds first computer Colossus used by the allies to crack the ultra German secret codes had on the outcome of final phase of the war is difficult to quantify. Dyna Jet 1 that produced 1.5N. Following the end of WW2 there where parrallel devlopment programmes undertaken in both USSR Russia and the US To produce new pulse jet rockets. In 1948 the Russians launched a copy of the German V1. Today cruise missles are still a strategic weapon used by both the USA and Russia. Soviet cruise missiles developed during the 1950's and 60's flew at 1.5Mach. During the Gulf War satellite guided cruise missles where used to fly low level ground profile hugging missions on specific targets. as long as you give us proper credit (by referring to "The Water-Rocket Explorer" http://waterocket.explorer.free.fr".